Twin Cities Wine Education is proud to present a new concept in wine learning. Join local wine expert Chris Griese for a new format of wine education, The Wine Academy. These educational and tasting seminars will be topical by month, focusing on a particular region in the world of wine. All classes average 90 minutes in length, include four great wines to taste, and a ton of learning and discussion. The March 2019 class focuses on the big islands of Italy: Sicily and Sardinia. Sardinia, along with Sicily, remains a mystery to many wine drinkers. They are both ancient lands at the crossroads of cultures. The control of the islands have transferred hands many times over the centuries resulting in a melting pot of grape varieties and styles that is unlike anywhere else. 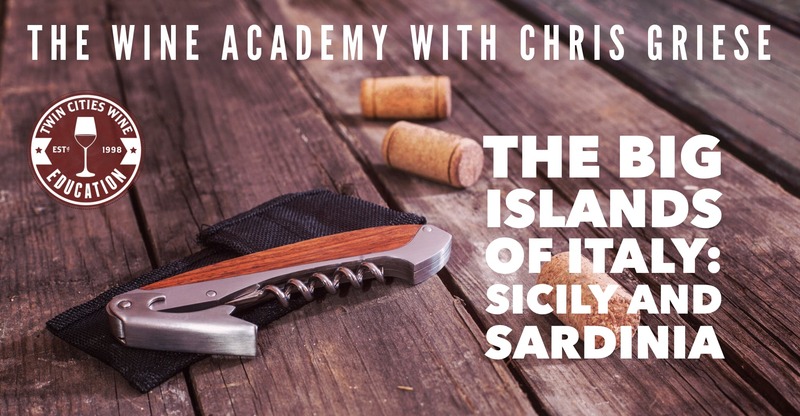 In this new class join expert Chris Griese on a journey of Sicily and Sardinia, from the people and the history to the soils and climates. You’ll learn all the key grape varieties and regions, along with ideas for meals via great recipes. To cap it all off, you’ll learn the history and health benefits of the Cannonau grape, featured in the Blue Zones research by National Geographic writer Dan Beutner. Four great wines will be served during this 90-minute class. The event will include extensive handouts, maps, articles, and more. We hope you can join us! Chris Griese is one of the most experienced wine experts in Minnesota, having run three key fine wine distributors over his 30+ year career. He has now left the wholesale industry to focus on wine education as well as sake importation for the eastern United States (he’s one of the only WSET Level 3 Sake experts in the country). His presentations are info-packed, lively, and come from a background only possible with experience.